He defied stereotypes, shattered convention, and went on to become one of the most beloved entertainers on the planet. 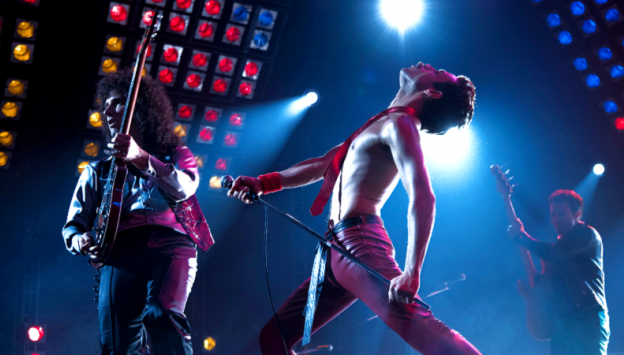 BOHEMIAN RHAPSODY centers on iconic Queen lead-singer Freddie Mercury, brilliantly portrayed by Rami Malek (SHORT TERM 12, BUSTER'S MAL HEART). Alongside the band's meteoric rise to fame and unparalleled success, Mercury was dealing with an undercurrent of darkness - leaves to pursue a solo career - but manages to reunite with his bandmates just in time for Live Aid. Facing a life-threatening illness, Freddie leads the band in one of the greatest performances in the history of rock music. Queen cements a legacy that continues to inspire outsiders, dreamers and music lovers to this day.